The Cheat System Diet was developed by PEERtrainer, an online community based on the idea that social support is the most important factor in weight loss. Members of the site have been successful dropping excess pounds using the “PEERtrainer Cheat System”. The Cheat System Diet introduces this method to anyone who is looking for a simple and less frustrating way to lose weight. 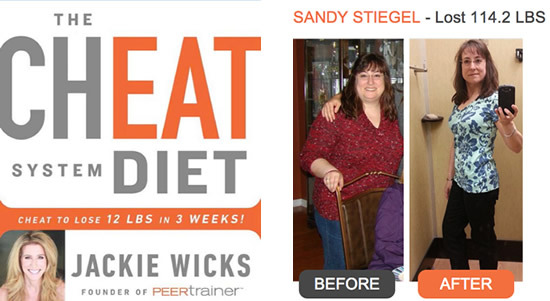 The author and founder of PEERtrainer, Jackie Wicks, offers an approach for “cheating” on your diet in moderation. You will learn a system for eating the right amount of healthy foods, while indulging in a little of everything else. The Cheat System Diet helps you make gradual, subtle changes so your body doesn’t rebel. It is a very flexible way of eating that reduces the stress of dieting but still effectively enables you to lose weight. The diet is based on a simple system that divides foods into two categories: Cheats and Eats. You don’t have to count how much fat, fiber or sugar is in your foods. All you have to do is keep track of your intake of “Cheats” and “Eats”. Eats are the nutrient-dense foods that best support your health and weight loss efforts. Unlimited “Eats” include foods like broccoli, cabbage, kale, spinach, cucumber, tomatoes, celery, zucchini, beans, lentils, strawberries, blueberries, and grapefruit. You can have as many of the unlimited eats as you want at any time. There is no need to measure portions and you can eat as many servings as you like. Dieters are also allowed limited amounts of “eats” in the form of “good proteins, and fats”. These include grass-fed meat, organic poultry, wild-caught fish, free-range eggs, avocado, almonds, pistachios, walnuts and coconut. Cheats are the foods most people crave such as pizza, bacon, cookies, chocolate, ice cream and alcohol. A cheat is the equivalent of 100 calories. You don’t need to worry about anything other than the number of calories in the cheats you eat. You get to eat any food you want on the cheat list as well. In the beginning you get 10 cheats a day. It is also possible to earn an extra 1.5 cheats a day by making healthy choices such as: Eating a tablespoon of flaxseeds or chia seeds or consuming an extra ½ pound of green vegetables. Eventually you will minimize the frequency of your cheats for even greater benefits. Dieters who want even better results can undertake the 14-day fresh start cleanse. This program eliminates common food allergens including gluten, corn, dairy, eggs, soy, peanuts and GMO foods. Cheat System offers the advice to slow down and shorten the length of your workouts. When you exercise too hard your body produces too much of the stress hormone, cortisol. This can lead to cravings, overeating and accumulation of excess body fat. It recommends that you walk for 20 minutes every second day. On the other days you will perform stretching and alignment exercises that are outlined in the book. The Cheat System Diet: Eat the Foods You Crave and Lose Weight Even Faster — Cheat to Lose Up to 12 LBS in 3 Weeks retails at $25.99. Encourages the consumption of nutrient-dense foods. Any food is permitted in moderate portions. Allows you to adjust your diet at your own pace. You can save up your cheats for a special occasion. Includes three weeks of meal plans with recipes. Does not require a strenuous workout regime. Weight loss may occur at a slow pace, especially in the beginning. Vegetarians and vegans will have difficulty following the provided menu plan. Does require counting your portion sizes of certain foods. Some dieters may be confused by the foods that are counted as “eats” at some times and “cheats” at others. The Cheat System Diet essentially focuses on nutritious, low-calorie foods while limiting your intake of less healthful choices. This program provides the health and weight loss benefits of a high-nutrient diet. Simultaneously it offers flexibility making it easier to follow long-term as a healthy lifestyle approach to weight management.